This website SITE is intended to offer an ever evolving insight into my practice: both as an artist and a worker. I am using the categories of Projects, Services and Collaborations to provide multiple entry points into my work. Ideally visitors will be able to make links between each of these sections, as an important aspect of my artistic production is recognizing the ways in which all of my labour (artistic and otherwise) overlap in ideas and ideals. I am not restricted by medium, instead my works take on the forms required to best represent the ideas and concepts considered by each project. In many of my works I bring everyday items into the rarefied space of the gallery, and it might not always be clear what constitutes the work. My practice produces a minimal amount of waste. I take on many different roles and positions in order to make it possible for me to make my work and my life sustainable. Gig work, such as cooking and preparing crew lunches, providing education workships, djing parties, working as a house painter or as a barista in a coffee shop, allows me time and flexibility to make work as an artist. As I am not tied to any specific medium I often work with others to produce aspects of my work. This assistance is integral in helping me to realize my vision into material. With such a focus on labour in my work, it is important that these workers are paid fair labour costs when helping to produce work. 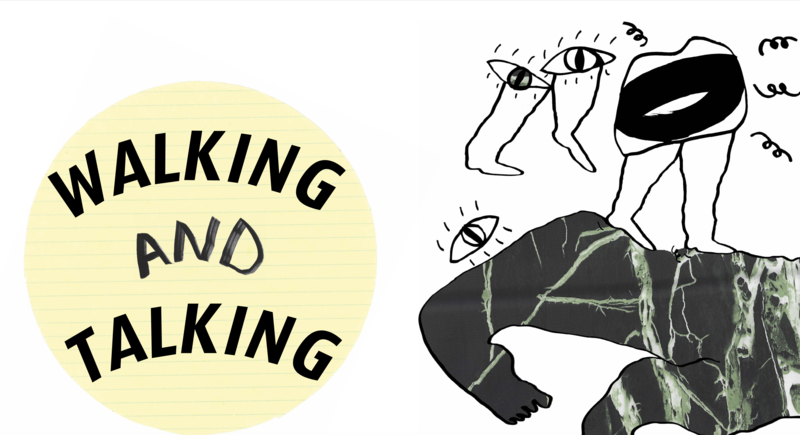 Walking and Talking is an educational workbook created by Basil AlZeri. Basil is a visual artist living and working in Toronto, Canada. His practice involves the intersection of art, education, and food, taking multiple forms, such as performance, interventions, gallery and public installation. Walking is one of the foundations of School Hop. We walk together to and from galleries, studios and artist-run spaces. We navigate through these spaces, absorbing our surroundings. The act of walking is not only a mode of transportation, but an artistic practice that has seen a resurgence in contemporary art. Walking-based art suggests new or reimagined paths through political resistance, the exploration of racism, colonialism and ableism. Walking art facilitates the exploration of time, geography and distance. Walking allows artists and those engaging with their work a way to explore, connecting conversation and movement. School Hop is a youth initiative that provides education and outreach to Toronto’s secondary-school students in the face of reduced art eduction funding. Led by artist facilitators, School Hop brings students on tours of galleries, artist studios and artist-run spaces. Students are offered a unique opportunity to participate in Toronto’s cultural landscape in this free, half-day program. By providing provocative encounters with art, School Hop improves visual literacy and critical thinking skills for 875 public high school students annually. Walking and Talking is a new component to the program, aimed at enhancing School Hop’s impact on participating students and their teachers. Thanks to: Nick Brown and The Canadian Art Foundation and School Hop Program.